The Museums for Us project drew to a close on 27th January with a seminar to share experiences and ideas hosted by the Smithsonian Center for Education and Museum Studies. We are currently drawing all the visits, reflections and the seminar’s discussions into a booklet which will be published on this website in the next month or so. The aim for the booklet is to explore people’s experiences of the visit and the ideas that emerged from the project in a very accessible and engaging way – and in a way which works both for people with intellectual disabilities and for those who work in museums. I’ve posted a couple of slides here to show the initial approach we’ve taken and this will be subject to more feedback and discussion from everyone involved in the project. 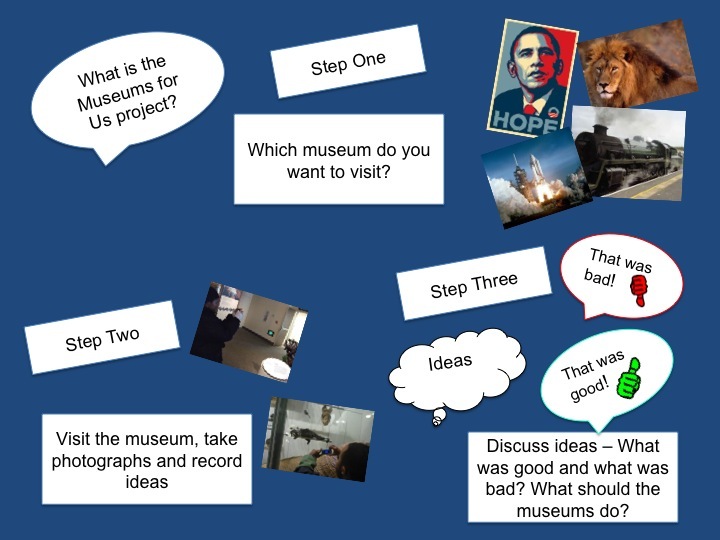 One of the key challenges was how to link the experiences of the museum visit with more conceptual level ‘ideas’ which speak to museums’ broader mission (e.g. 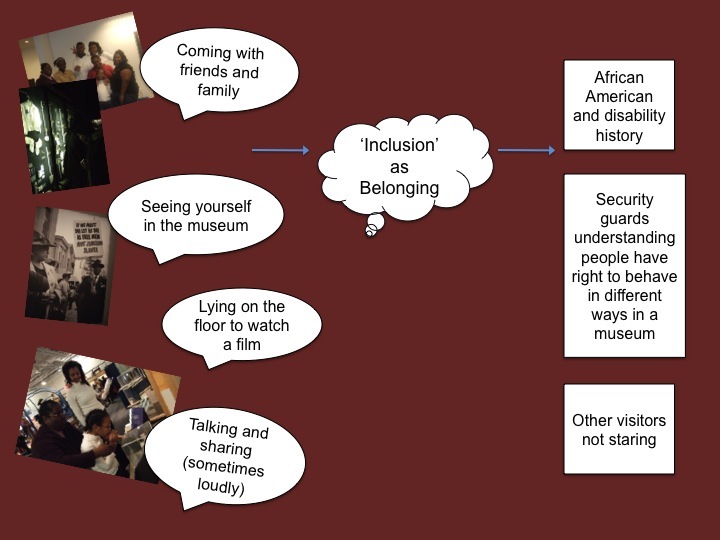 inclusion, access, engagement) and then to the practicalities of what museums might do. 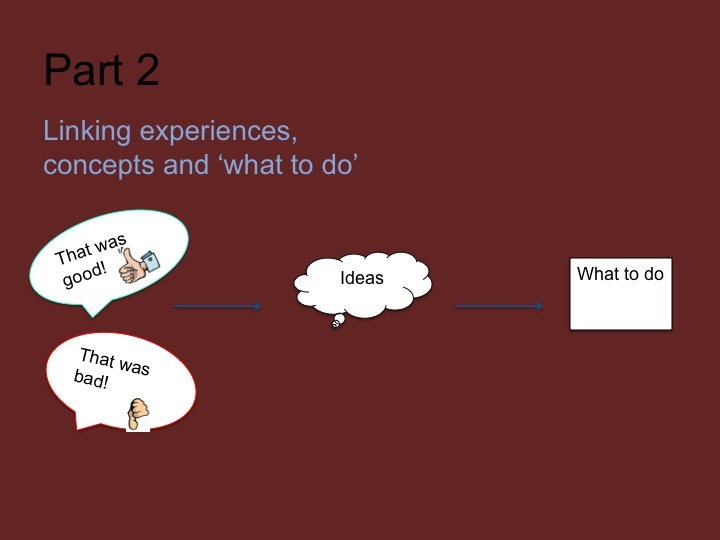 The approach we’ve taken is to build up ideas from experiences and then link ideas (the kind of ideas which exist in museums’ vision, mission and strategy statements) to very specific practical steps. We hope this will ‘earn’ the more conceptual and abstract ideas by reconnecting them to specific experiences and breathe specific life and meaning into ideas very often used primarily in an abstract way by museums. Thank you so much for this opportunity to voice our concerns regarding our children having a positive experience in our community at the museums. I also learned more about my son’s interests through this endeavor.